There are no walls in kids’ playgrounds. I remember the little neighbourhood playground I used to go to in Seletar Hills. The 70s era of playgrounds were simple open spaces with a slide, a roundabout, some swings and a climbing net. Somehow my memories are of endless hours of taking turns on all the playground equipment and somehow nobody seemed to get into fights over turn taking. Of course, it probably helped that we had alert parents nearby to keep the play civilized, but perhaps those were also simpler days where all the neighbourhood kids knew each other. These days the playgrounds are sophisticated and complex and the jostling for choice pieces of equipment seems to be more frenetic and less friendly. I remember having to guide my kids in their forays in the playground to make sure that they were not assaulted by the hyperactive explosions running around. I wonder if the children are becoming less self-regulated with the increased exposure to screen-time or perhaps a lack of experience in social interactions. Anyway recently I was invited to play in friend A’s kitchen playground. Everyone should have a friend like that, with enough kitchen space to have several instant pots chugging along at the same time. She set up this first SG Instant Potters’ cookout to celebrate National Day, and it was a blast. Friend A had enough kitchen equipment that we were able to prep our own food with ease, and there was enough space that we weren’t tripping over each other, pretty much like the childhood playground I grew up with that had enough space and everybody got a turn at the roundabout. There was lots of fun doing this cookout, with Instant Pot dishes on the menu like pork carnitas, seafood boil, pasta and chocolate lava cake. 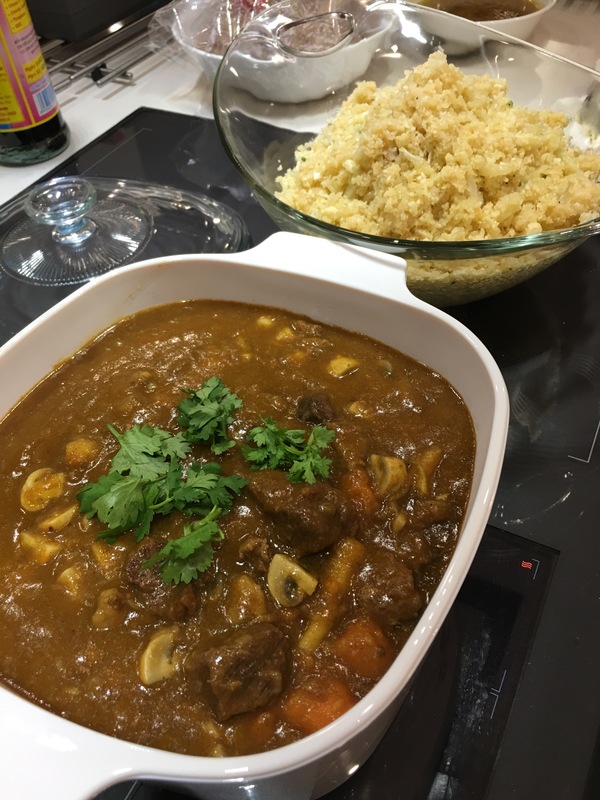 My own offering was an experiment on Japanese beef curry with cauliflower rice. 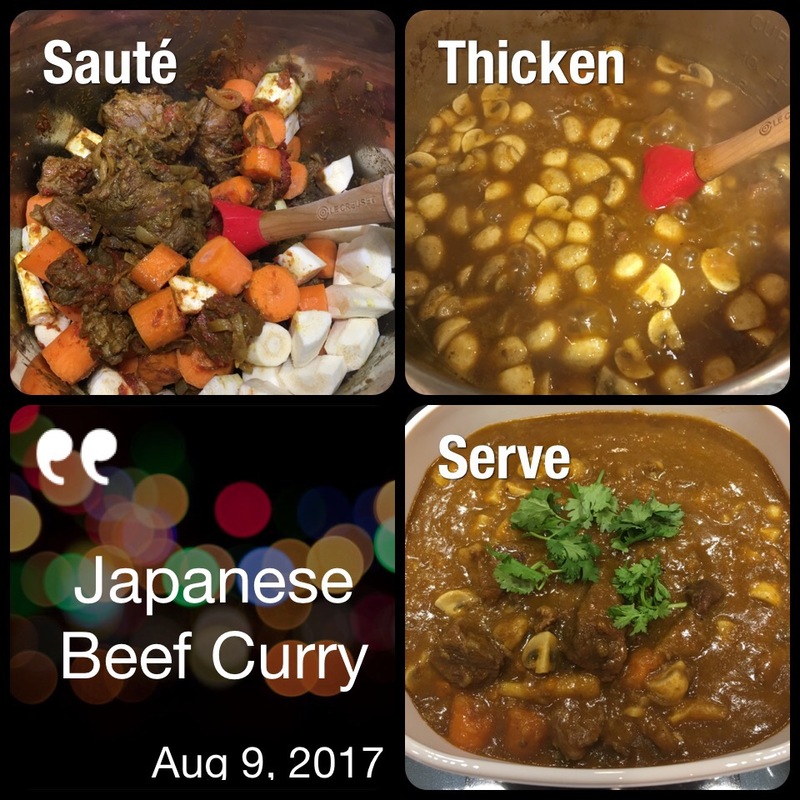 Japanese beef curry is mild enough that children can eat it without flinching and has sweet tones that are probably more acceptable to younger palates. This version of beef curry was low carb and so parsnips rather than potatoes were used. Cauliflower rice is of course much lower in carbohydrate count than regular Japanese rice, which made this a guilt free meal. But at the end of the day the best thing about the meal was the friendship and lots of laughter and chatter – essential ingredients for any cookout. Heat up 2 tbsp olive oil in the Instant Pot with the pot on sauté mode. Sauté the onions, stirring frequently till the onions are well caramelized and softened, about 8-10 minutes. Remove and set aside. Clean the inner pot. Add another 2 tbsp oil to the pot and put on sauté mode again. Make sure the sauté mode is adjusted to “high” to get a good sear. Add the beef cubes in batches, browning on all sides. Remove and set aside. Add the onions, beef cubes, parsnips and carrots into the pot and add the salt, pepper, and curry powder and sauté for 2-3 minutes, mixing well. Add the tomato paste, fish sauce and chicken stock, with just enough to cover the meat and vegetable pieces. Close the pot and set the valve into the sealed position. Use manual high pressure and cook for 35 minutes. Do a quick pressure release. Put the pot back into sauté mode and sprinkle the xanthan gum on top. Stir through well. Add the mushrooms in, and keep stirring the curry intermittently to make sure that the bottom does not burn. When the mushrooms are done and the curry is thickened, about 10 minutes, pour the curry into a casserole dish and serve hot with cauliflower rice. I love Japanese curry. Thank you!